NHL hockey returns to the great outdoors once again this New Year with one major twist: fans will get twice the action on the outdoor ice. NBC Sports will produce two outdoor games in two days: The NHL Centennial Classic featuring the Red Wings and Maple Leafs on Jan. 1 at BMO Field in Toronto and the NHL Winter Classic featuring the Blackhawks and Blues at Busch Stadium in St. Louis on Jan. 2. NBC Sports has been here before, of course. In 2014, the NHL Stadium Series required the Peacock production team to deliver back-to-back outdoor game telecasts at Dodger Stadium and Yankee Stadium on Jan. 25 and 26, and once again at Soldier Field on March 1 followed by the Heritage Classic at BC Place on March 2. However, this year, NBC has the added challenge of being the sole rights-holding broadcaster at the Winter Classic. First up, NBC Sports will team up with primary broadcaster Rogers Sportsnet to produce the Centennial Classic on New Year’s Day at Toronto’s BMO Field – a soccer-specific stadium that is home to the MLS’s Toronto FC (as well as the CFL’s Toronto Argonauts). NBC, which will have a crew of 60 on hand, will utilize NEP ND6 as its primary mobile unit. NBC will deploy a total of nine unilateral cameras as well as take feeds from Sportsnet and TVA. Among the cameras will be a Sony HDC-4300 high-speed cameras, an RF Sony HDC-2500 handheld, and a Sony P1 robo. Sportsnet will provide variety of specialty cameras, including a RefCam, CableCam system, aerial helicopter shot and two robos, while TVA will provide netcams. NBC’s pregame coverage of the Centennial Classic, which kicks off the league’s year-long Centennial celebration, will be anchored by Kathryn Tappen and analyst Jeremy Roenick. Since the pregame coverage will primarily feature the Centennial celebration, NBC will not deploy a full on-site set at BMO field. Once the puck drops, John Forslund (play-by-play), Brian Boucher (analyst), and Pierre McGuire (Inside the Glass) will call the action. 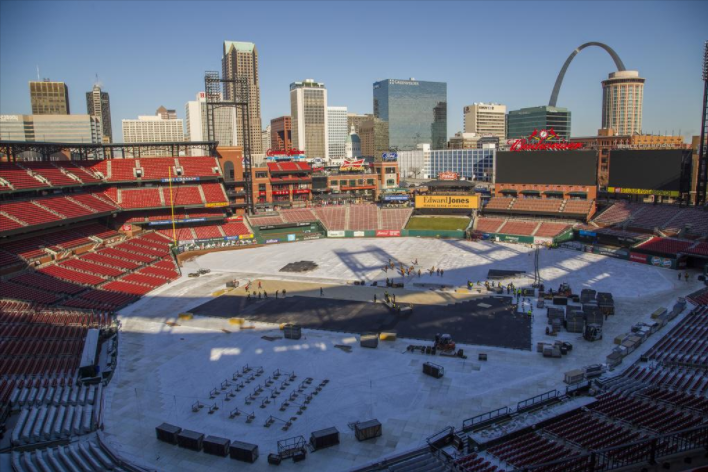 The next day, NBC will kick it into high gear as the sole rights-holding broadcaster for the Winter Classic at Busch Stadium – home to the St. Louis Cardinals. NBC’s massive production will run out of NEP’s ND 5 and Super B mobile units and feature 130 crew members. Goss and company will deploy a total of 31 cameras, including two HDC-4300 cameras running at 6x-slo-mo, a RefCam (worn by referee Tim Peel), a Skycam Wildcat system, two RF Sony HDC-2500 handhelds, three Sony P1 robos, two netcams, and a fixed-wing aerial shot. In addition, NBC will deploy Ross Video’s virtual graphics/augmented reality system for the first time on an NHL game. with Ross Video for the first time in a NHL game. As has become standard on larger NBC Sports shows, the remote production will be tethered heavily to NBC Sports’ broadcast center in Stamford, CT, moving upwards of 1 Tb of file-based content for the Winter Classic. For the second consecutive year, NBC Sports Group will produce the Winter Classic in 5.1 surround sound. Flood’s philosophy that the Winter Classic is not just “a game”, but rather “an event” holds true this year, as NBC will deliver a host of on-site shoulder programming surrounding the game itself. The primary studio set at Busch Stadium has been built into the stands and is located down the third-base line at the top of Section 154. NHL Live host Liam McHugh and analysts Mike Milbury, Keith Jones and Roenick will man the set for pre-game, post-game, and intermissions. Once the puck drops, the estimable Mike ‘Doc’ Emrick (play-by-play), Eddie Olczyk (analyst), and McGuire (Inside the Glass), and Roenick (roving reporter during the game) take over to call the Blackhawks-Blues showdown. In addition, Bob Costas, who began his professional broadcasting career in St. Louis, will join NBC Sports’ coverage of the 2017 NHL Winter Classic.